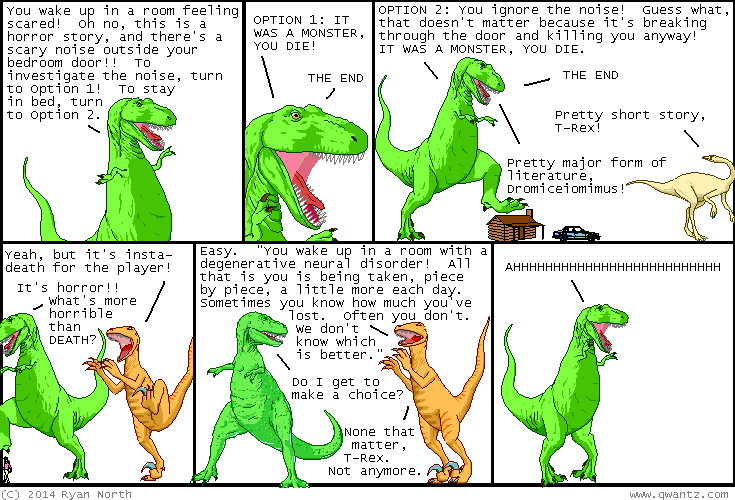 Dinosaur Comics - September 9th, 2014 - awesome fun times! –The first is to go further in something than anyone has before! September 9th, 2014: I wrote this comic a few days ago only to wake up to the news this morning that John Mann announcing he has early-onset Alzheimers. 51 years old! I feel like most of us have someone in our lives with dementia, and there are lots of Alzheimer's charities supporting research for treatment and prevention who could use your help: here's the Alzeimer's Society in Canada. One year ago today: you'd have to spend like a rich uncle pennybags, peanut in a top hat and monocle, or other similar corporate mascot just to keep up!